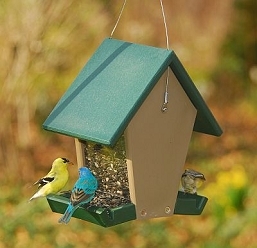 3 Sizes: 16", 24', 30"
Helps prevent bird seed from falling to the ground! 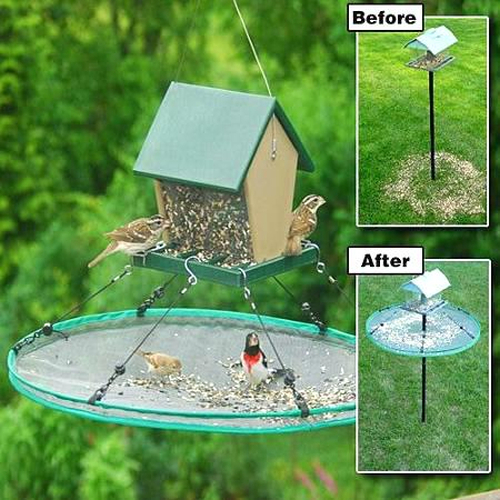 Save money and your lawn with a Seed Hoop Seed Catcher! Saves money by catching up to 90% of spilled seed! Protects lawn and garden from rotting seeds, weeds, and damage to grass. 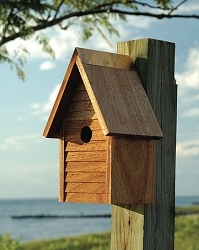 Keeps birds safe from ground predators and eliminates a food source for rodents. 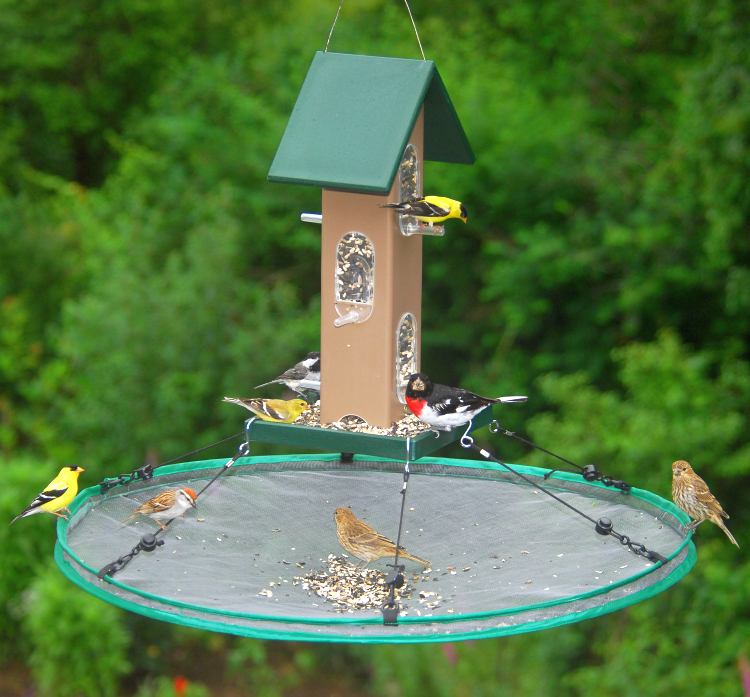 The Seed Hoop is durable, lightweight and easy to attach, and adapts to virtually all bird feeders. Straps to bird feeders via 6 cords each 36 inches in length. 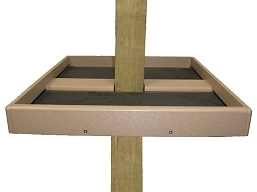 Has a wind guard which saves even more seed. Made of light weight exterior grade vinyl coated fiberglass mesh. The frame is of lightweight flexible tempered steel wire that can be twist folded and collapsed to 1/3 its expanded size for easy storage. 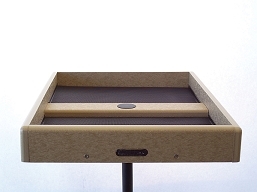 The sleeve is made of exterior grade polyester. Hooks are corrosion resistant. 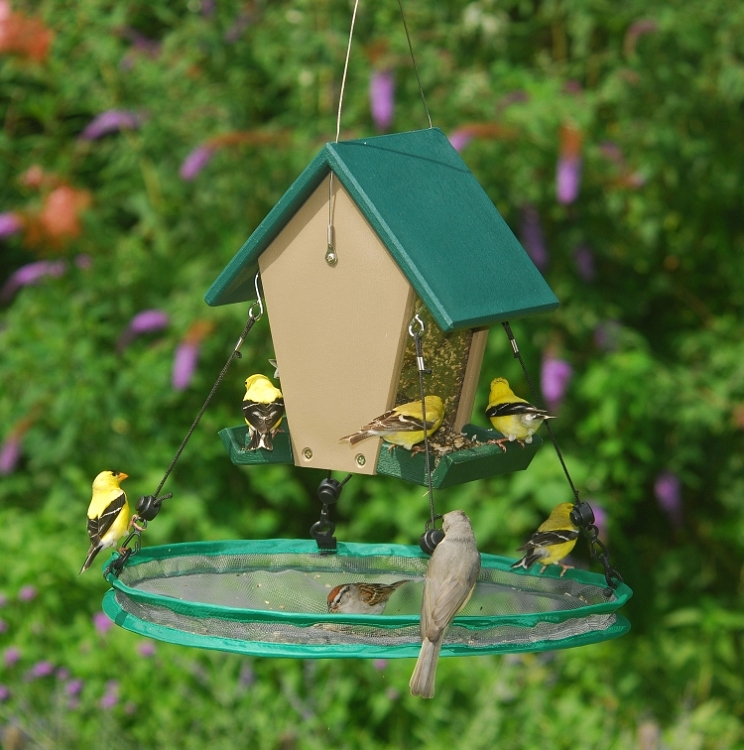 Nylon cords adjust easily to virtually any feeder. Feeder in picture not included. 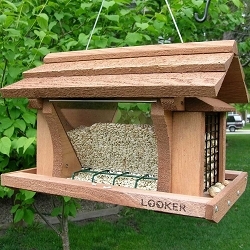 Makes it possible for those in an apartment to still feed the birds. 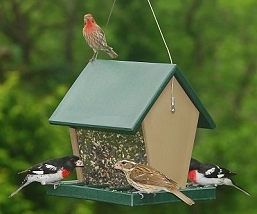 Provides another feeding level for birds like Cardinals and Juncos. Seed Hoop Sizes - Available in standard 30" diameter - Shown above hanging from the Rubicon Recycled Plastic 2.5 Quart Large Hopper Feeder (sold separately), 24" diameter, and 16" diameter - Shown below with the Rubicon Recycled Plastic Small Hopper Feeder w/Sloped Tray (sold separately) that is perfect for shepherd hooks and tubular bird feeders. Select Seed Hoop size at checkout. 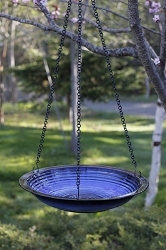 The 30”, 24" or 16" diameter base is made of lightweight exterior grade vinyl-coated fiberglass mesh which catches spilled seed but allows water to drain and seeds to dry. 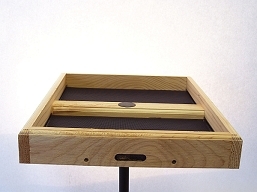 The Seed Hoop frame is made of lightweight tempered steel wire that provides flexibility so that it can be twist folded and collapsed to fit into a bag about 1/3 its expanded size. The 1/2” sleeve is made of exterior grade polyester, as is the storage bag. Heavy nylon straps sewn to the outer circumference, attach corrosion resistant D-rings to the hoop. 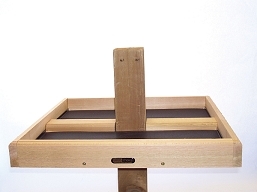 The attaching hooks are also made of corrosion resistant metal. The round button cord snap and small connecting hooks are made of plastic. Cords are nylon. 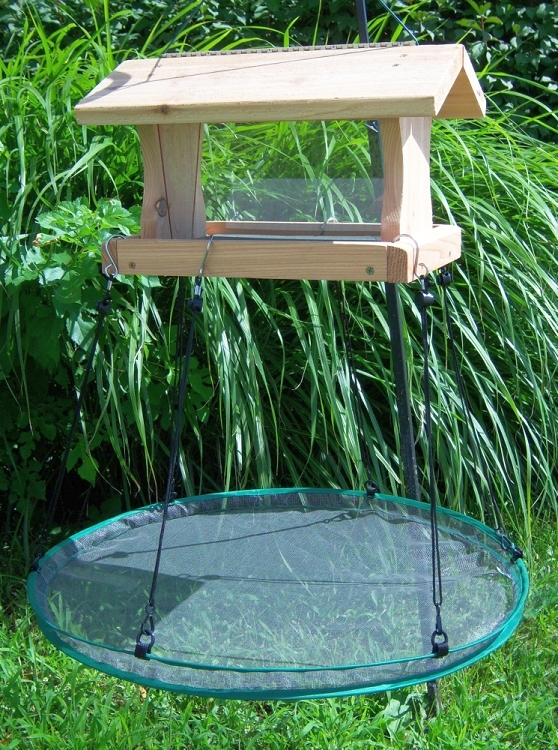 Bought the 24 inch Seed Hoop to hang below a small hopper bird feeder. Works great! 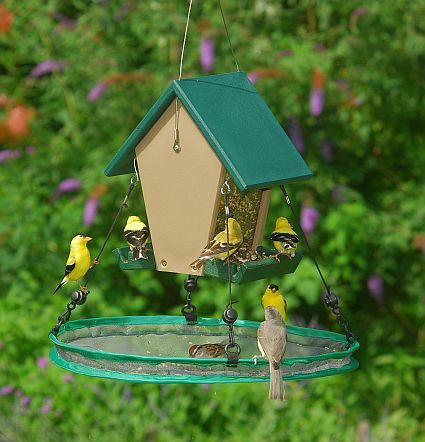 Catches the fallen seed and birds love eating from the Seed Hoop screen platform. Seed no longer lands on the ground! 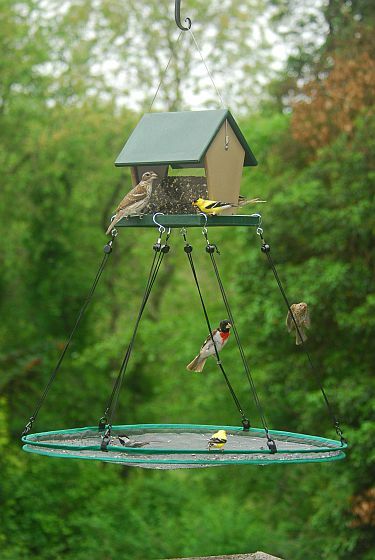 Birds Choice Pole Mount Seed Catcher Platform 20"x16"
Birds Choice Recycled Pole Mount Seed Catcher Platform 20" x 15-1/2"